It's been a battle for Dawn Richard but the singer/song-writer has risen to the top and is set to release her first official studio album GoldenHeart next week (15 January). "The last six years have been a battle for people to understand and conform me into what they really want me to be and I've kind of had to protect that throughout this whole journey."... "It’s kind of the story of me protecting this GoldenHeart, which really kind of symbolizes my own heart and my passion for this music thing and really who I am." In early 2012 Dawn released her EP Armor On which went straight to #1 on the iTunes chart and since then everyone has been waiting for her long awaited album to drop. 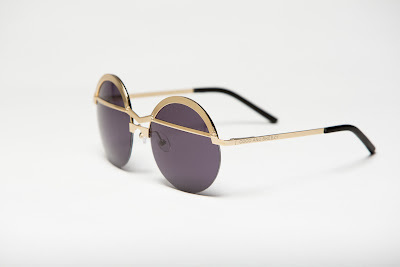 Richard has teamed up with eye-wear designers and twin sisters - Coco and Breezy for a pair of limited edition 'GoldenHeart' eye-wear, as part of their Omrose S/S 2013 look-book. If you've been following Dawn Richard's journey you'll see that it was not an easy one and it feels so good to see her still doing her passion and what she loves - many years later. I respect Dawn so much and I will be surely adding her new album to my iTunes folder. Dawn is also planning on releasing the video to '86' next week. GoldenHeart is the first installment of her Trilogy albums, which includes: BlackHeart and RedemptionHeart. Listen to the album snippets and get excited of the greatness that's to come from Dawn Richard this month and year! Can't get enough of Dawn Richard? Check out the promo pics she took for GoldenHeart inside! Werrrrk!! 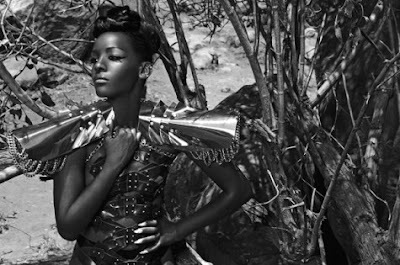 Dawn Richard takes on Joan of Arc in these new promo pics and she does a great job at it! Rocking a pair of Jeffrey Campbell heels, Malgorzata Dudek, Laureluxe metal shoulders, an Una Burke leather bodysuit - Dawn still shows that she has her armour on and is wearing it proudly. Dawn has always been one to be ready for a battle and for her to portray the fierceness in her pics... Beauty!